The headquarters of Valeant Pharmaceuticals International, a multinational specialty drug company based in Quebec. Until recently, investors were positively star-struck by drug companies that could raise prices indiscriminately, letting their patients struggle to pay the freight. Lauded for a laserlike focus on shareholder returns, companies like Valeant Pharmaceuticals International, a multinational specialty drug company based in Quebec, received high marks and even higher valuations from besotted shareholders. Now, however, investors are beginning to see the peril in such a business model. Sure, price jumps may generate earnings and stock gains, but when the enrichment of a few comes at the cost of many, unwanted scrutiny often follows. Hijacked drug prices blasted to the forefront two weeks ago after a report in The New York Times told the story of how Martin Shkreli, the chief executive of the privately held Turing Pharmaceuticals, bought Daraprim, a 62-year-old infectious disease drug, and immediately raised its price to $750 from $13.50 a tablet. When a firestorm ensued, Mr. Shkreli accurately noted that his was not the only company to acquire a drug and then send its price into the stratosphere. The spotlight soon fell on Valeant, which generated $8.25 billion in revenue last year, up 43 percent from 2013. Among its well-known drugs is Ativan, a treatment for anxiety. Valeant caught the eye of Congress this year after it increased the price of two heart medications it had just bought the rights to sell: Nitropress and Isuprel. Valeant raised the price of Nitropress 212 percent and Isuprel 525 percent. Democratic members of the House Committee on Oversight and Government Reform, led by Elijah Cummings, the Maryland Democrat who is its ranking member, have been investigating rocketing drug prices. This year they asked Valeant to provide documents about the increases; it declined. So last Monday, 18 Democratic members of the committee asked its chairman to subpoena Valeant for those documents. It is unclear whether the subpoena will be issued. But Valeant’s stock slid 16.5 percent on the news. It recovered somewhat later in the week, but it has lost more than 30 percent since its August high closing price of $262.52. With the stock plummeting, J. Michael Pearson, Valeant’s chief executive, sent a letter to reassure employees. 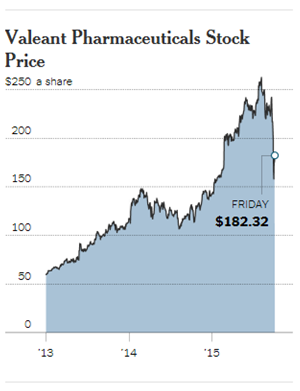 In it, he rejected investor concerns that the company’s strategy relied on big price increases. He noted that half of the company’s sales came from domestic and international businesses in which it had realized small or no net price increases. Valeant is “committed to focusing on our key stakeholders while delivering consistently high performance,” its website states. But satisfying customers’ needs for affordable drugs can conflict with company executives’ desires for a rising stock price. At Valeant, executive pay is heavily tied to shareholder returns. Laurie Little, a spokeswoman for Valeant, responded in a statement that the company priced its treatments based on many factors, “including clinical benefits and the value they bring to patients, physicians, payers and society.” It also has “robust patient assistance programs to help patients who face financial obstacles,” she said. One argument for high prices on pharmaceuticals is that the money goes to research for new cures. But this is not a Valeant strategy. While other multinational pharmaceutical companies spend well into the double digits as a percentage of sales, Valeant’s 2014 annual report shows that the company spent $246 million on research and development — just 3 percent of sales. Another way to think about that: Valeant paid its five highest-paid executives 1.5 percent of sales, or $123 million, last year. The drug company is known for growing through acquisitions and cutting costs. Rather than developing drugs, though, Valeant acquires them. Since 2010, it has acquired companies with a total value of at least $36 billion, mostly in the United States. It is the sixth-largest acquirer, globally, by deal size. In 2010, the predecessor to Valeant, based in California, was acquired by Biovail, a Canadian company. It relocated to Canada, a jurisdiction with a lower tax rate; the combined operations were named Valeant. The move to Canada has been highly beneficial to Valeant, as detailed in a recent congressional report on the impact of the United States tax code on corporate activities. Published in July by the Senate Permanent Subcommittee on Investigations, the report found that by moving to Canada, Valeant lowered its statutory tax rate to 27 percent from 35 percent. But that barely captures the true scope of Valeant’s ability to escape taxes. Its actual cash tax rate is far lower, the report found. Valeant’s effective cash tax rate has fallen substantially, too, to 3.3 percent last year from 5.9 percent in 2010. Valeant’s acquisitions have clearly generated wealth for its shareholders. The same cannot be said for many of the workers at the companies it acquired. 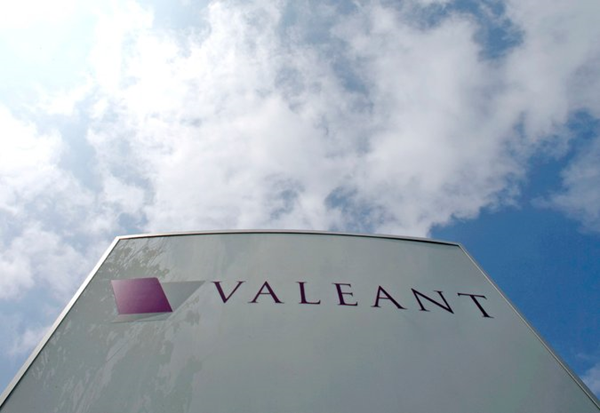 The Senate report details layoffs made by Valeant after three large acquisitions: Medicis Pharmaceutical in 2012, Bausch & Lomb in 2013 and Salix Pharmaceuticals this year. When Medicis was acquired, it had 790 full-time employees, the report said. Valeant terminated 750 of them, mostly in the United States. Bausch & Lomb had 4,103 workers when Valeant came calling. It fired 3,000 workers in that acquisition, half domestically. As for Salix’s 977 workers, Valeant is planning to jettison 420 of them, all based in America. The company has also said it will transfer some of Salix’s contract manufacturing to Canada and Britain from the United States. As of June, Valeant’s full-time American work force was 5,725, the report said. Its overseas head count was 13,644. Valeant is by no means the only company whose strategy skews rewards to executives and shareholders. That’s unfortunately the way the game is played nowadays. But does it have to be? A company’s earnings are not generated in a vacuum. They are a byproduct of its practices and principles. If investors assessed corporate earnings quality through that kind of lens, they might just help make the world a better place. Crazy, I know. But isn’t it even crazier to leave everything up to executives who manage only to their stock price? A version of this article appears in print on October 4, 2015, on page BU1 of the New York edition with the headline: Side Effects of Hijacking Drug Prices.